I’d like to begin my very first post with this statement, “I HAVE NO IDEA WHAT I’M DOING”. But let’s not pay attention to that; what I would like to make clear is that most of these recipes I’ve tried only once or not at all. I want my blog to be a realistic approach to cooking and or crafting. We are all beginners here, maybe some more experienced than others. Let’s keep this in mind as we go on this journey together. 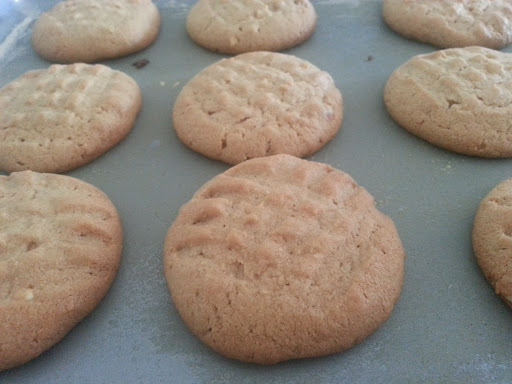 Peanut butter cookies have to be one of my absolute favorite kinds of cookie. They teeter in between savory and sweet resulting in an unforgettable, melts-in-your-mouth sensation. I can’t help it, guys. I friggin’ love them. 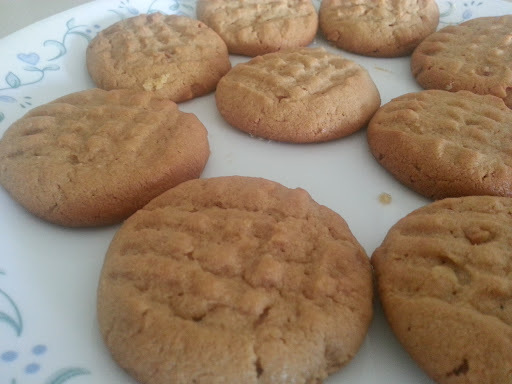 I have had a go at plenty of peanut butter cookies recipes before. Well, when I say “plenty” I mean I baked some blossoms and perhaps a variation of this recipe. However, this is my very first attempt at baking this shockingly delicious batch. Without further unnecessary banter, I provide you with images and instructions! 2. In a different bowl, you’re going to add your egg and vanilla extract until well incorporated, as to say until their bodies become one. After which, you will gradually add to sugar and butter mixture. 3. 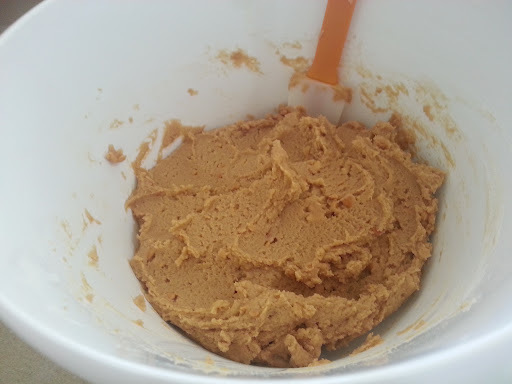 To this mixture, you’re going to add your peanut butter until it’s well blended. 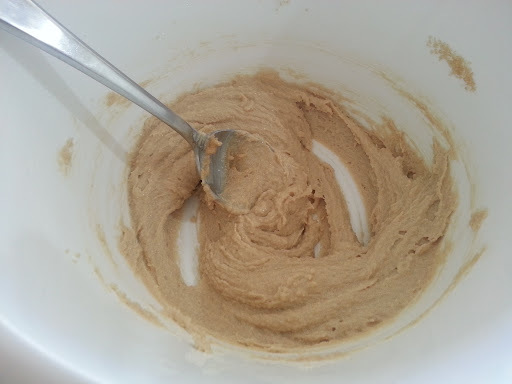 Then, you’ll want to take your flour and baking soda and add them into the batch, making sure to stir everything until it takes the shape of majestic cookie dough (you’ll know when it’s perfect, it’ll come to you in a dream). 4. Chill or refrigerate your cookie dough for 1- 2 hours. DO NOT FREEZE. I did this once with another peanut butter recipe… It doesn’t work too well with peanut butter. 5. Guys, you know you have to preheat your oven, right? You have to! It’s the almighty cooking/baking law. For this cookie, (and most) you will preheat your oven to 350 degrees. 6. This recipe suggests you grease your baking sheets. I, on the other hand, don’t usually grease my cookie sheet for my peanut butter cookies. I did for this one. Nevertheless, it really depends on what you’re using to bake. Grease if you have to! 7. Now, I am assuming all of you have washed your glorious, yet beautiful hands, right? Good. I’m glad we got that out of the way. Well, you are going to take those hands and dip them into your batter because you’re going to make some 2 to 2 ½ inch balls. After you place your perfectly shaped balls unto the cookie sheet or whatever you are using, you will grab a fork and become the magnificent pastry artist that you truly are while making criss-cross patterns on the cookies. 8. Bake for 10 – 12 minutes. Keep an eye on these! No one likes a burnt cookie. 9. Once they’re golden brown you’ll want to place them on a cooling rack and give them a little time to toughen up or they’ll crumble all over. This was the finished product! They were pretty friggin’ delicious. Ooooh these look yummy and lucky me I have two new jars of PB! Gisela, you have got to put those jars to good use. Off you go, bake these delicious cookies and let me know how it turns out! look yummy!! i like your all post many thanks for the share!! have a amazing day! !